How did the river valley embodied in Duncan Hall come to be? Outram explains it by relating it to a common mythic heritage. When early civilizations set out to colonize, they sent forth a raft or an ark. The raft carried people, fire, and civilization. It would float until it struck new land. At that point, the colonists would use the transported fire of their old home to start the fire of their new home. They had, in effect, moved their civilization, their ideas, their fire to a new land. The raft would decay or break up, but the essential elements"people, ideas, and fire, or energy," would persist. The roof structure of a classical building recalls this raft structure; in fact, its supporting members are often called "rafters." A decking on the rafters supports a pyramidal roof or "pyre." In Outram's architecture of ideas, this superstructure, or entablature, represents that mythical raft. Thus, above the column capitals, we find the blue logs of the raft. They are still dripping wet; the swirls remind us of the chaotic waters of the flood. Above the logs, we find a green "saddle" that is the deck or table (entablature) upon which the ark rides. It is colored green because, in the raft, it is the lifespace, the level where people can actually live. On the table rests the pyramid of the raft, containing civilization, ideas, and fire. The raft of computational engineering rests on a field of columns, impaled on Texas' alluvial plain. In Outram's myth, it came to rest on a mountain. The act of impalement opened a hole deep in the mountain's core into which the flood receded. As the water rushed out, it eroded the interior into the river valley, revealing in the process the orderly hypostyle of columns. 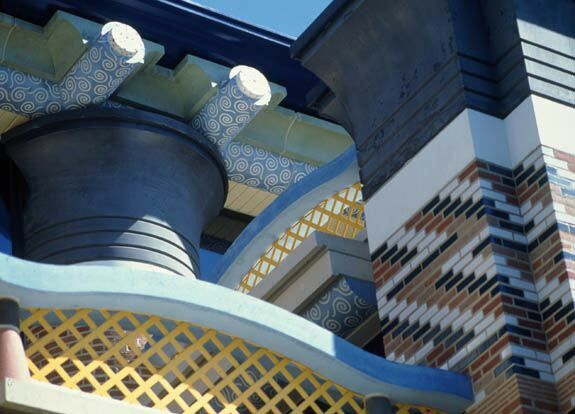 On the exterior, we see the geological striations of the eroded stone-a faint reminder of Outram's myth. The classic vocabulary of architecture uses the word "entablature" to describe that part of the building above the columns. The word appears to derive from in-tablatum, meaning a table or planked surface. The tablinium was a room where one kept pictures, painted on wooden planks. Thus, we can envision the entablature as a table on which one places ideas, mediated by text or pictures. The ideas are visible on the outside, where openings appear at the high windows and terraces, or where a ceiling coffer protrudes upward into the ark. In the Main Hall, the ceiling reveals some of these ideas, with its iconic representation of the birth of consciousness. This founding myth also explains the ceiling of Martel Hall. Viewed from the ground floor, the vault of the ceiling is a window into the lean-to that rests on the raft of Duncan Hall's roof. Since that primitive shelter on the raft holds the people's fire, their texts, their civilization, the ceiling should show those things. Thus, Outram has inscribed on the ceiling (in the lean-to of Duncan Hall's raft) a cosmological myth--indicative of the great ideas and traditions carried on the raft of migration.